Aquatint engraving after a painting by Harry (Henry) Hall (United Kingdom, c. 18141882) depicting the famous horse Iroquois. 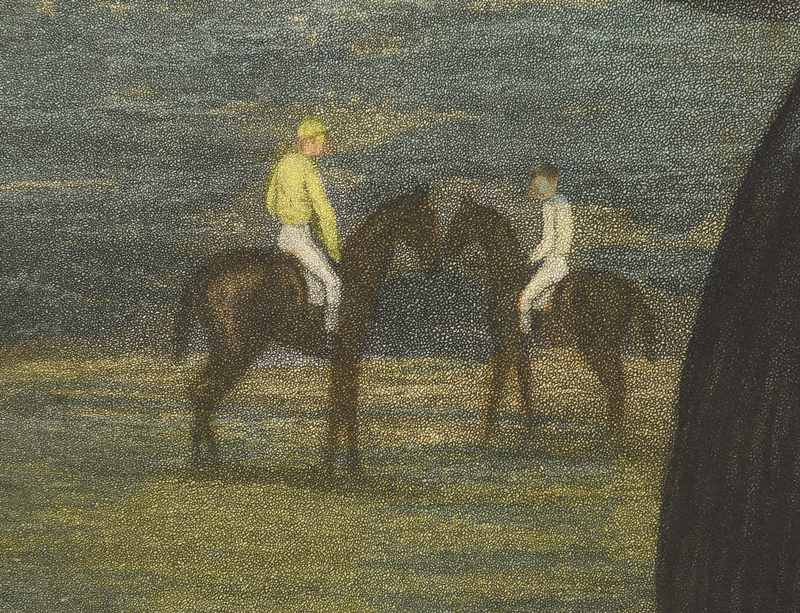 The thoroughbred and his jockey stand in profile in the foreground, while three other horses and their jockeys linger in the background. Titled "IROQUOIS. 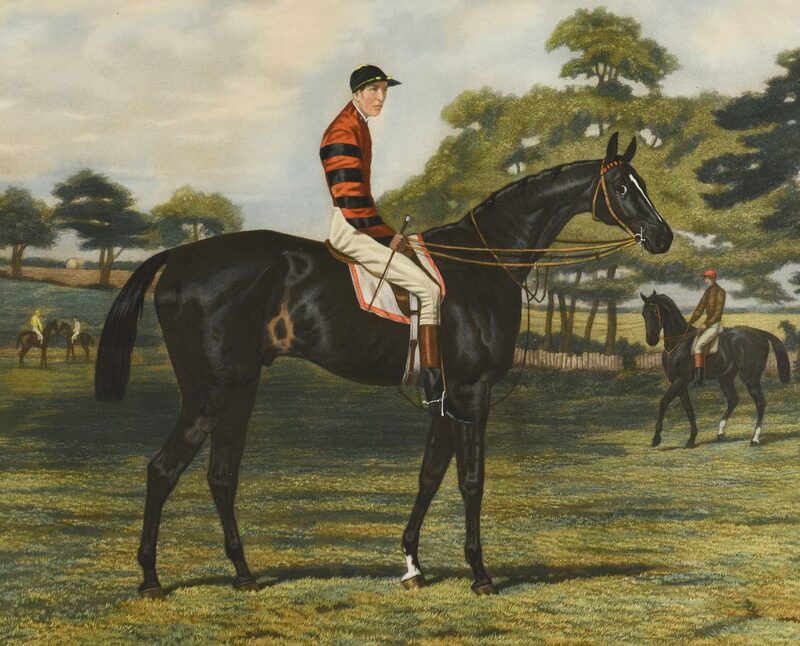 Winner of the Derby Stakes at Epsem and the St. Leger Stakes at Doncaster 1881_The property of Mr. Pierre Lorillard. BY LEAMINGTON OUT OF MAGGIE B.B. 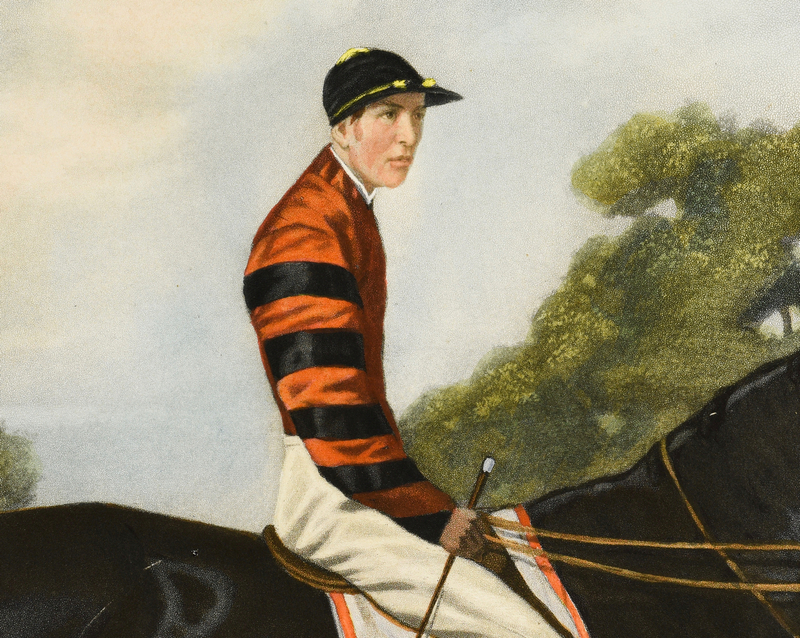 _TRAINED BY J. PINCUS_RIDDEN BY F. ARCHER" in lower margin. London, Published by A.H. Baily & Co. 15, Nicholas Lane; Paris, Coupil & Co; New York, M. Knoedler & Co. 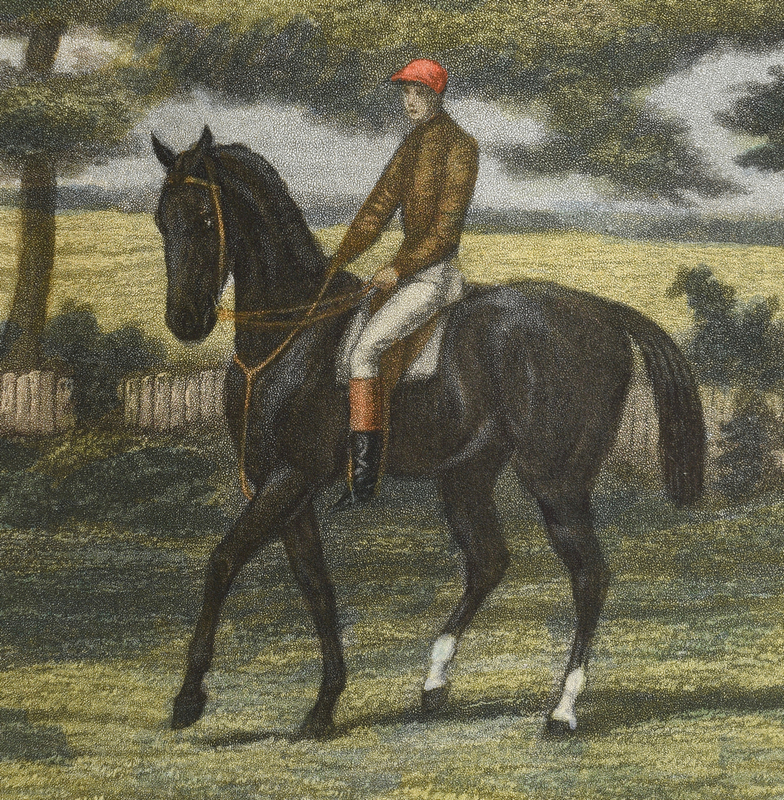 PAINTED BY HARRY HALL lower left under image, ENGRAVED BY E.G. HESTER lower right under image. Housed in a black wooden frame with black and gold matte. Image – 19 3/8" H x 25 1/2" W. Framed – 32 3/4" H x 37 1/2" W. Provenance: Private Nashville, TN collection. Note: Iroquois (18781899), was the first American-bred Thoroughbred race horse to win the Epsom Derby at Epsom Downs Racecourse, Epsom, Surrey, England. He went on to win the St. Leger Stakes at Doncaster Racecourse. In 1886, Iroquois was purchased by Tennessee cotton planter and former Confederate Civil War general William Hicks Jackson and moved to Belle Meade Plantation in Nashville. 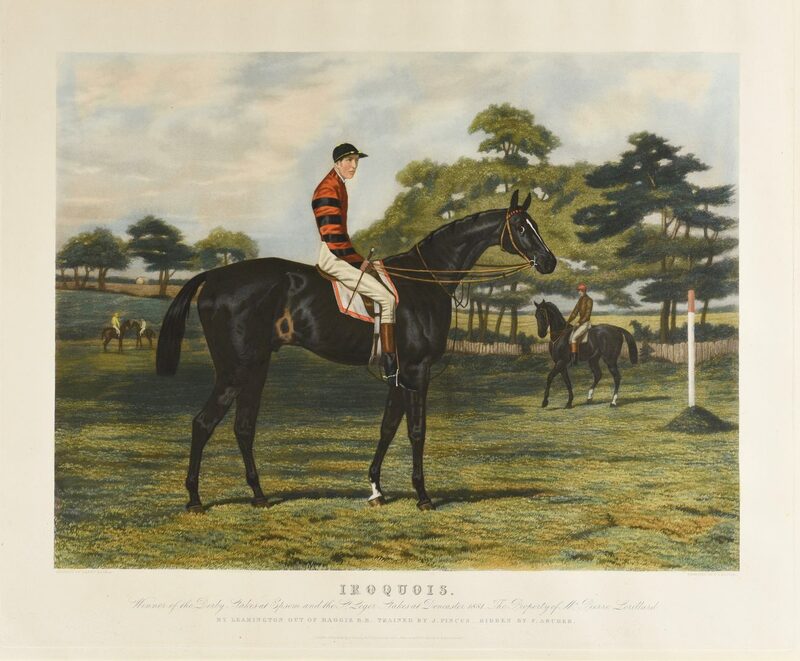 Iroquois did well at stud, becoming the leading sire of 1892. 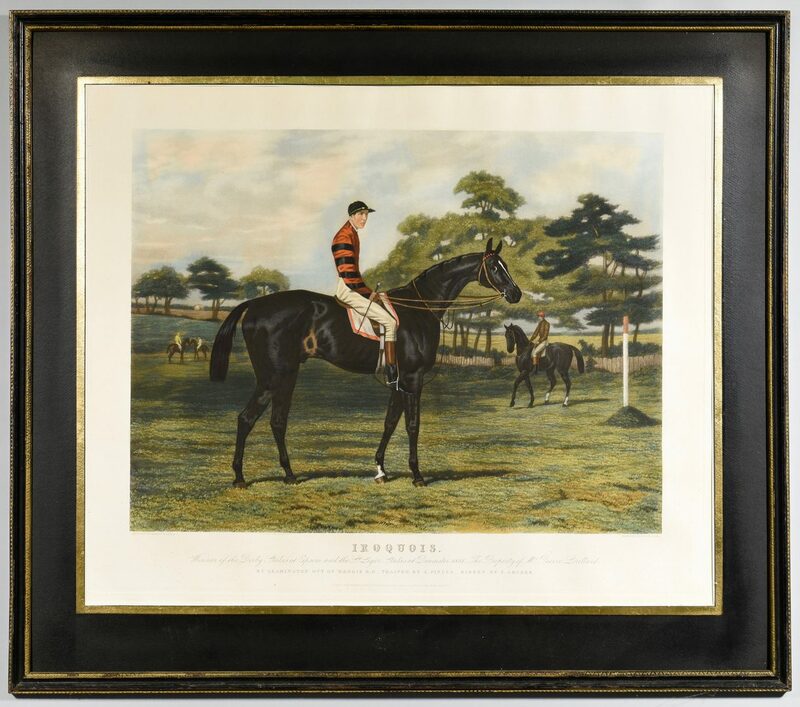 The Iroquois Steeplechase horse race, held in Nashville, TN every spring since 1941, is named in honor of Iroquois. CONDITION: Glass missing from frame. 2 very slight abrasions to image, one on rear leg and the other to rear body of horse. Very light grime to surface. Engraving has shifted slightly in the frame.